Catching barramundi in the wet season needs some changes in fishing techniques because of cool fresh water in the barra's natural habitats. Cool water in the tropics? Who are you trying to kid? No kidding! - when tropical storms drop huge volumes of cooled water onto the floodplains and escarpments of the tropics, barramundi that are used to temperatures of around 300C become inactive. They head for pools of warmer water and wait, almost in a state of hibernation. Good fighting fish are still caught, if you adjust to the conditions. Look for pockets of warmer water, along the shallows, near underwater rock banks which have retained heat and warm the water. Use the temperature gauge on a depth sounder to look for pockets of warmer water where fish are holding. Try smaller lure sizes to tempt lethargic fish. Use loud lures - ball bearings rattle underwater and can be detected above the hum of an outboard. 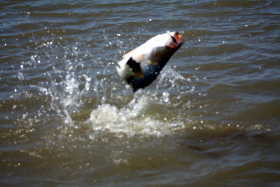 Try slow action lures which can be repeatedly worked past fish which have lost the energy to go looking for prey. If you know the fish are there, keep casting and working the lures until they can't resist striking. Return from Catching Barramundi in Wet Season Conditions to Enjoy Darwin Home.